With Manhola Dargis and A.O. Scott’s list of the films of the century (so far!) and having no assigned reading for summer courses, I thought I’d compile a list of summer reading. There is so much I want to get to on my never-ending “To Read” list, but these are a few I’m setting aside for this summer. We’ll see how many I manage to get to and what new discoveries I make along the way. I am perpetually behind on the latest and greatest novels. During a lecture with Peter Kemp, Chief Fiction Reviewer for The Sunday Times, he was asked how many novels he reads a week. The answer: an astonishing 7-10 a week. It’s his occupation, of course, to read and champion the best new works, so it makes sense that he reads at that pace. From what he said, it’s also an incredible gift he’s been given to be able read with such speed. I do not read at that pace and sometimes there are precious books that I want to take my time in and linger in that world for a while. I still haven’t read the last page of Jane Eyre in attempt to not leave that world, and there are other works I prolong finishing just to stay with the characters, setting, prose…whatever magic there is…a bit longer. So with summer, I’m happy to have the time and hope to find a few books that make me want to stay a while. By all accounts Colson Whitehead’s The Underground Railroad and Yaya Gysai’s Homecoming are supposed to be riveting reads. I also picked up Chang-Rae Lee’s On Such a Full Sea and Martin Amis’s The Zone of Interest, two authors I have not read before. David Rakoff’s Love, Dishonor, Marry, Die, Cherish, Perish has been sitting on my bookshelf for four years now. Written in iambic tetrameter, and “insist[ing] on beauty and the necessity of kindness in a selfish world,” according to the back cover, it sounds like a book I need right now. Before I see the film, I also want to read Daphne du Maurier’s My Cousin Rachel. I’m looking forward to being transported back to the coast and rugged terrain of Cornwall. 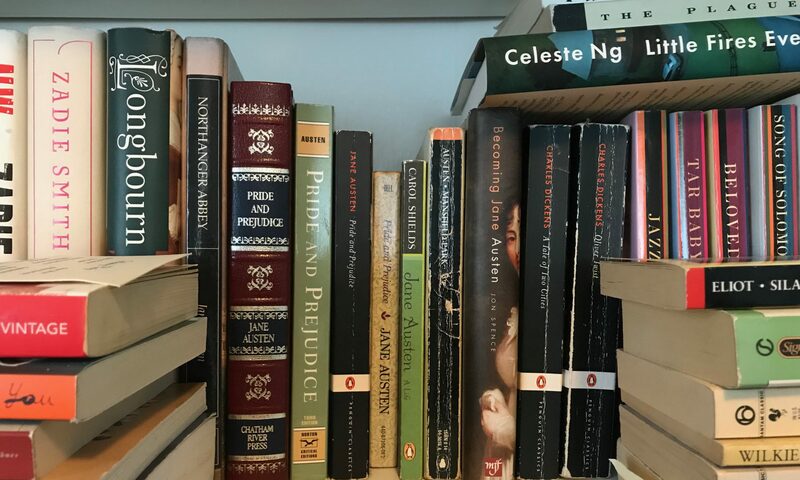 Last summer, I took a course in Victorian fiction and added many more titles to my ever expanding “to read list.” I won’t get to all of these, but plan on at least getting to Collins’ The Woman in White and Hardy’s final novel Jude the Obscure. With a love of British mystery novels inherited from my mother, I feel compelled to finally read The Woman in White, which is considered to be the first mystery novels. I’m not sure how ready I am for another Hardy novel; reading Tess of the D’Urbervilles was a difficult read, not because of the writing, but the torture that poor girl goes through! So while “eager” isn’t necessarily the word, I am interested in reading Jude the Obscure in part to see what those late Victorians were so worked up about that it was was referred to as Jude the Obscene. I must finish Peter Hook and Bernard Sumner’s competing New Order memoirs, Substance: Inside New Order and Chapter and Verse: New Order, Joy Division, and Me. New Order/Joy Division are my favorite band with their punk roots and dance/indie songs. They’re al so fabulously ridiculous and pretentious, caught up in a larger pop narrative and Manchester music scene. They are, afterall, the band that had a high-selling single “Blue Monday,” which initially lost money for the band because of the intricate yet genius sleeve design. Reading their books is great fun and easy reading (one is more poorly written than the other, but it doesn’t matter), and I know there’s a fall out coming at the end and each book is meant to clarify/justify his position in matter. In Hooky’s book, he lists the tracks on the albums with anecdotes about the recording and requires a track-by-track listening of the record. Previous PostPrevious Could I love Jane Austen even more?